One of the best things about Rome is its proximity to beautiful countryside and seaside towns. Who else has the privilege of being just 40 minutes away from the sea, lake and countryside? 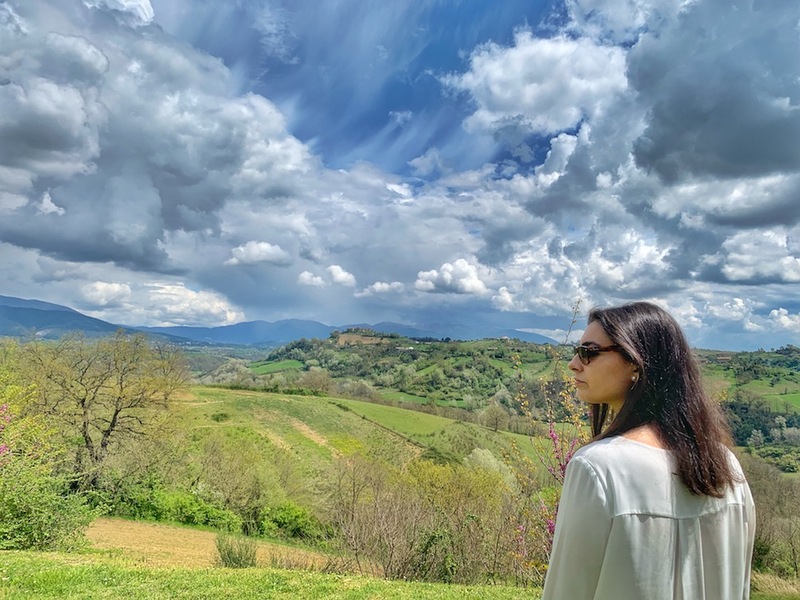 If you’re up for a day trip from Rome exploring a nearby town, or if you want to get away from the hustle and bustle of Rome and relax for the weekend, there are plenty of stunning places to visit near Rome. If you don’t have a car, you can still easily go on day trips from Rome by train. Just hop on the regional trains from either Roma Termini or Roma San Pietro stations and off you go! To explore some beautiful lakeside towns in the Lazio region just head on over to Bracciano, Anguillara Sabazia or Trevignano Romano. 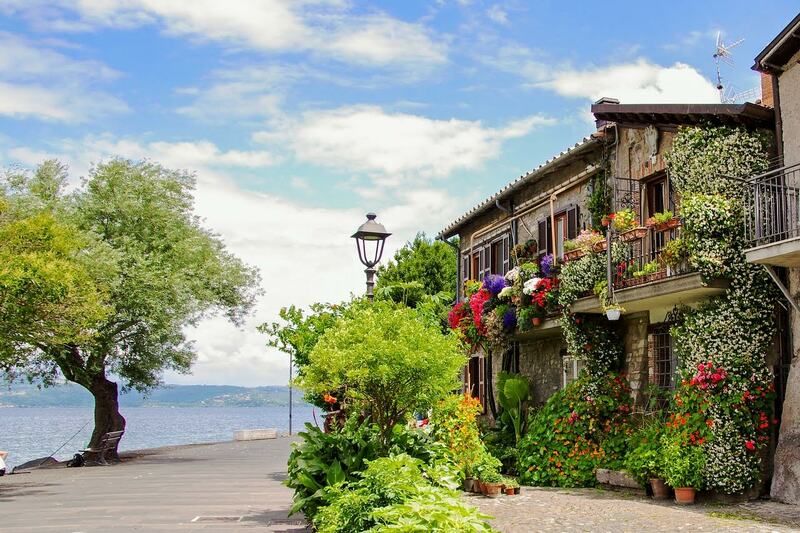 All three are lakeside towns along the shores of the famous Lake Bracciano. Medieval towns, beautiful views and a relaxing atmosphere are in store for you. And if you end up in Bracciano, check out the stunning 15th century Orsini Odescalchi Castle – famous for being the wedding location of celebrities such as Tom Cruise and Katie Holmes! Perched on top of the Monti Tiburtini hills on the Aniene River just East of Rome, Tivoli is home to some stunning UNESCO World Heritage Sites and breathtaking views. No day trip to Tivoli would be complete without visiting Villa D’Este, one of the most impressive Renaissance villas and gardens worldwide. 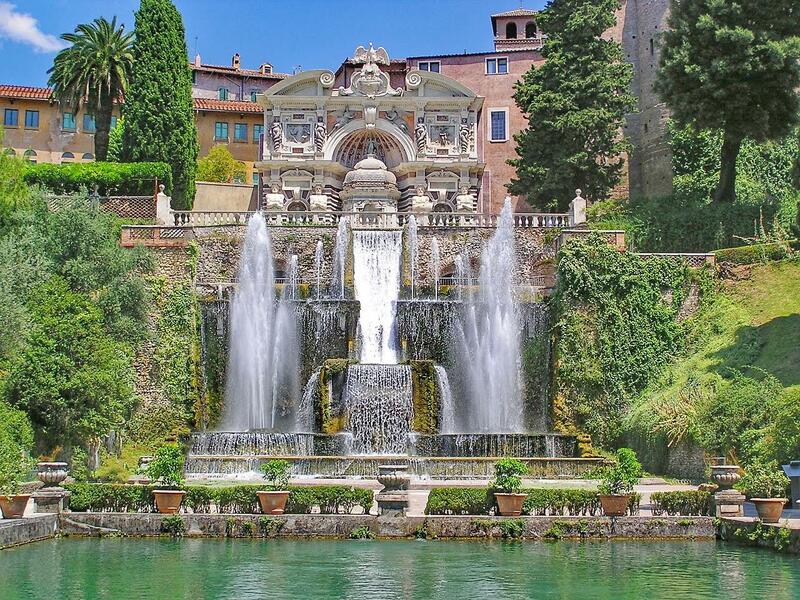 Cascading waterfalls, fountains and beautiful villas make Villa D’Este a unique example of a 16th-century Italian garden. Another must-visit is Villa Adriana, an exceptional complex of classical buildings created in the 2nd century A.D. by the Roman emperor Hadrian. 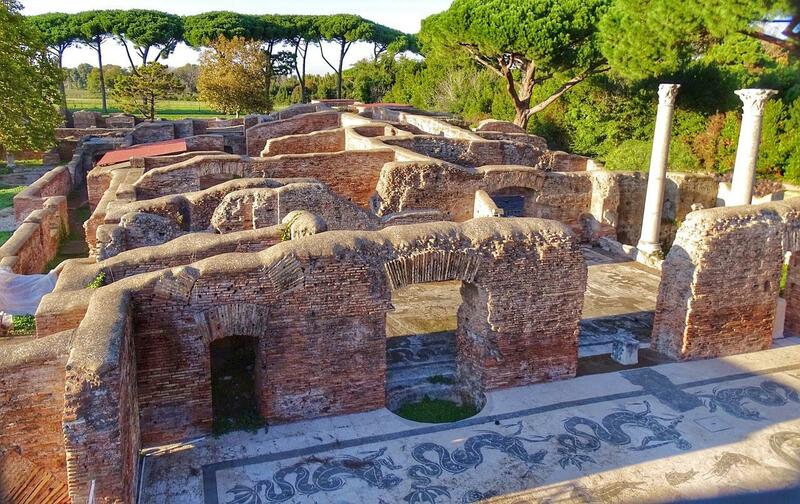 All archeological fans need to visit Ostia Antica – Ancient Rome’s seaport at the mouth of the Tiber River founded by the fourth king of Rome – Anco Marcio. The best part? You won’t find the tourist crowds you get in other archeological sites like Pompeii! Historically, Ostia Antica was a key port for the Romans, where innumerable goods were exchanged. Today, it is known as Rome’s “ghost town” for its wonderfully preserved ruins of streets, villas and frescoes. Check out the Terme di Nettuno, baths that date back to the 2nd century boasting stunning mosaic floors to be completely swept off your feet! 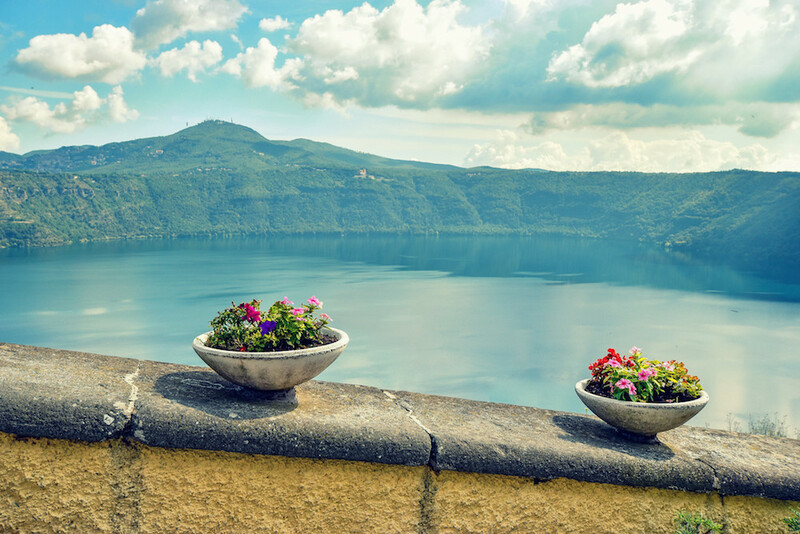 Overlooking Lake Albano, Castel Gandolfo is one of the towns of the Castelli Romani best known for the beauty of the nature that surrounds it and for the elegance of its historic center. 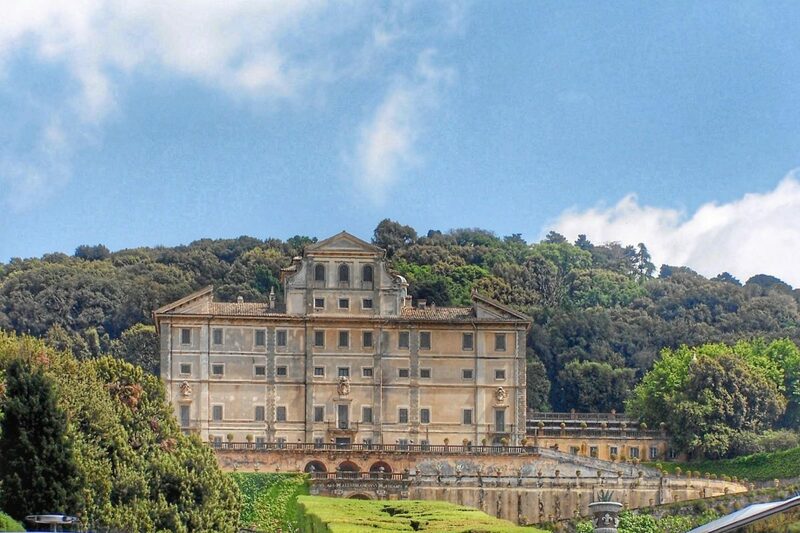 Not to mention it was the summer residence of the Popes for generations until Pope Francis decided to abandon the palace. And now, from April to October (excluding July and August) you can visit the stunning Pontifical Villas! Head on over to Antico Ristorante Pagnanelli for local specialties and amazing wine overlooking Lake Albano. Another famous town of the Castelli Romani area is the hilltop town of Frascati, just a short train ride from Rome. It’s known for its elegant aristocratic villas – a.k.a. Ville Tuscolane – built by wealthy Roman families in the Renaissance, as well as its rich gastronomic specialties and wine. In fact, Frascati is a renowned wine town, where the Frascati Superiore, Cannellino and Frascati DOP are produced. So hop on that train, visit the Roman villas and stop by for lunch in the centro storico! Medieval and Renaissance beauties, art and history await you in this beautiful countryside town. 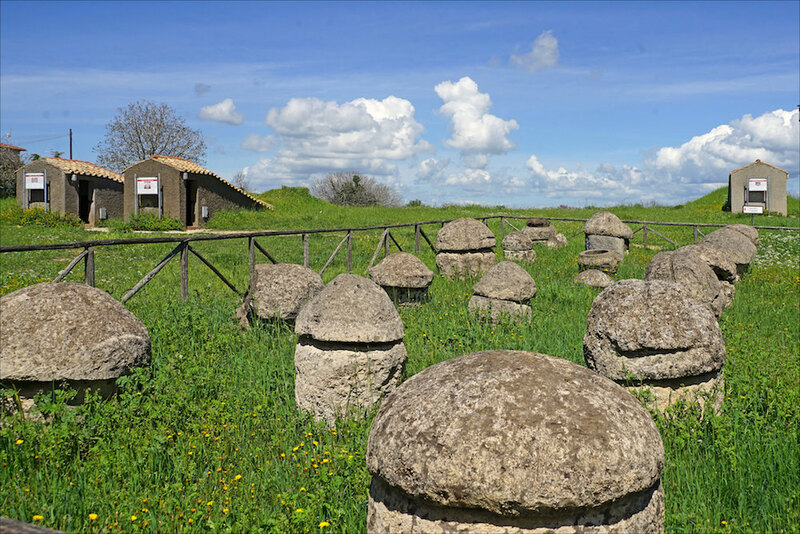 Dating back to Etruscan times, Tarquinia is one of the most ancient Etruscan cities and is the perfect mix of history, art and nature. Stroll through its historic center visiting Palazzo Vitelleschi and the Santa Maria in Castello church. But definitely don’t head back to Rome before visiting the famous Monterozzi Necropolis, one of the most important archeological sites of the area, declared UNESCO World Heritage Site in 2004. With its rich history, outstanding basilicas and churches, beautiful piazzas, ancient castle and Roman ruins, Assisi sure has a lot of things in store for you. Located in the Umbria region, bordering Lazio, Assisi is one of those medieval towns you will never forget. 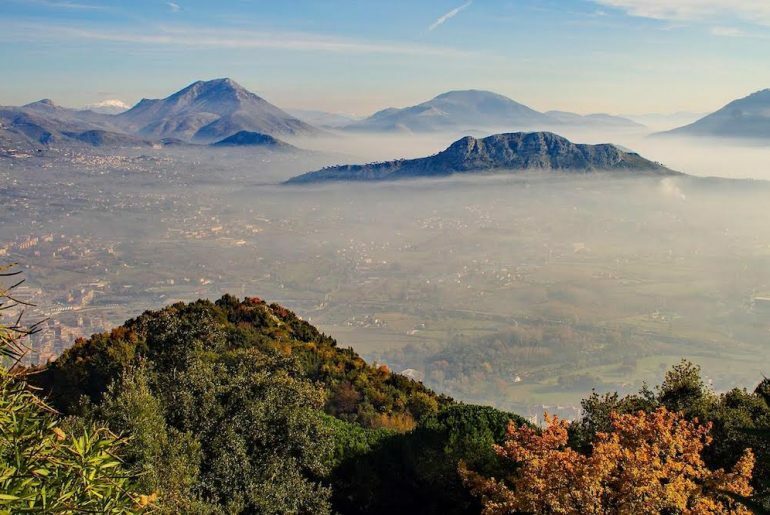 Perched on top of a hill, it offers stunning panoramic views of the Umbrian countryside, and is a short hike from the beautiful Mount Subasio, where you can also visit Eremo delle Carceri. From tasting delicious food and wine to visiting historical sites, Assisi is a must day trip from Rome. It’s no wonder it’s a UNESCO World Heritage Site. The Montecassino Abbey is one of the most famous abbeys worldwie. 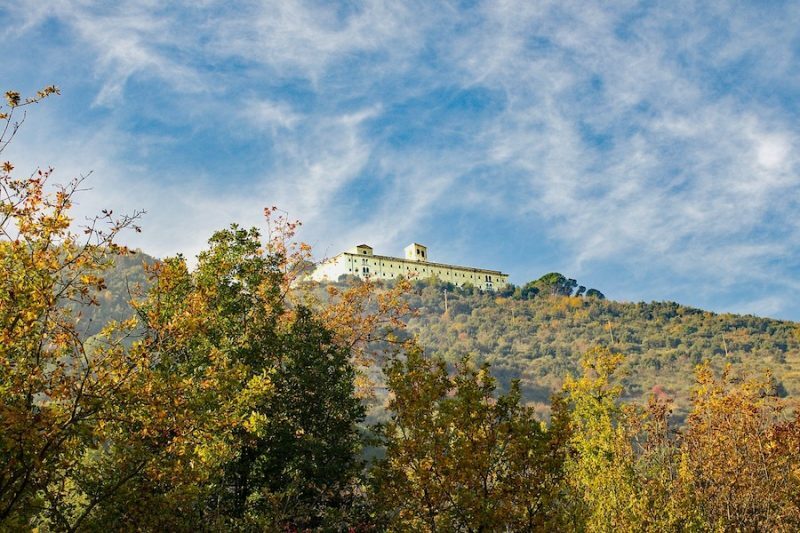 In 529 San Benedetto chose the Montecassino mountain to build his monastery. He was able to transform this place into an exemplary Christian monastery. Over the course of the centuries, the monastery was destroyed over and over again, until it was bombarded and completely destroyed in 1944. The Montecassino Abbey was then reconstructed to perfection and today thousands of pilgrims visit this wonderful place. Visit the Basilica and the tomb of San Benedetto and don’t forget to step inside the museum to browse through marvellous manuscripts and ancient books. If you don’t have a car, it will be hard to reach the following towns near Rome. But if you do have a car, In addition to the places mentioned above, you can easily reach the following day trips from Rome by car. 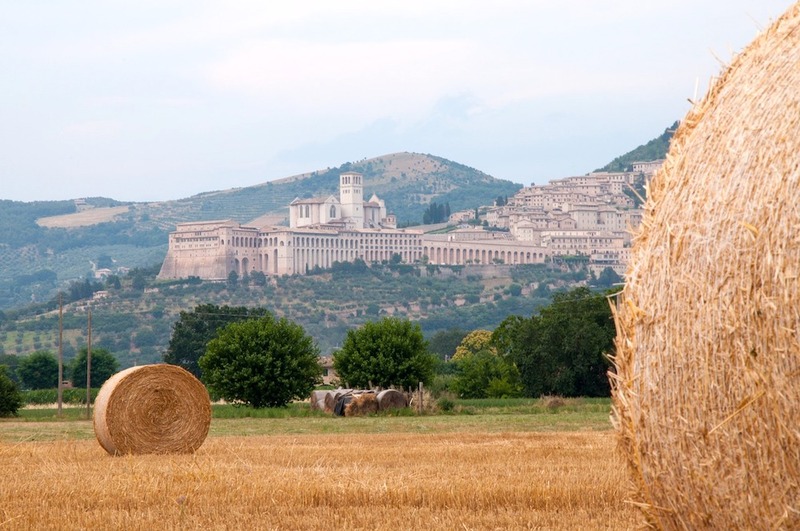 Sitting in the Lazio region and bordering Umbria and Tuscany, the Sabina countryside is a must-visit local’s gem. The panoramic views alone are worth the visit: from here you can see the Valle del Tevere and the Monte Soratte, towns and cities near Viterbo, the Monti Cimini, the Umbrian hills and the Monti Sabini and Tiburtini. Plus, hills covered in olive groves and vineyards. It’s a sensational setting. The town of Magliano Sabina is famous for its history and architecture and its events held throughout the year. Don’t miss out on the yearly Infiorata del Corpus Domini in June, where flowers are used to depicting the Catholic feast of Corpus Domini. It’s also the perfect base to explore Lazio, Umbria and Tuscany. For a magical day trip from Rome, the town of Civita di Bagnoregio has to be on your list. 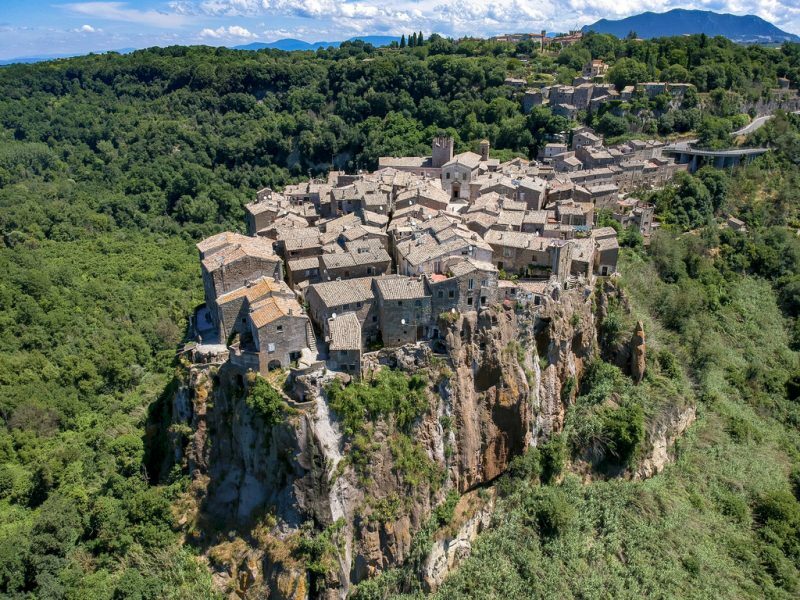 Known as “the dying city” for losing almost all of its inhabitants due to erosions and landslides, Civita di Bagnoregio is an ancient Etruscan town dating back to 2500 years ago with only 16 inhabitants! 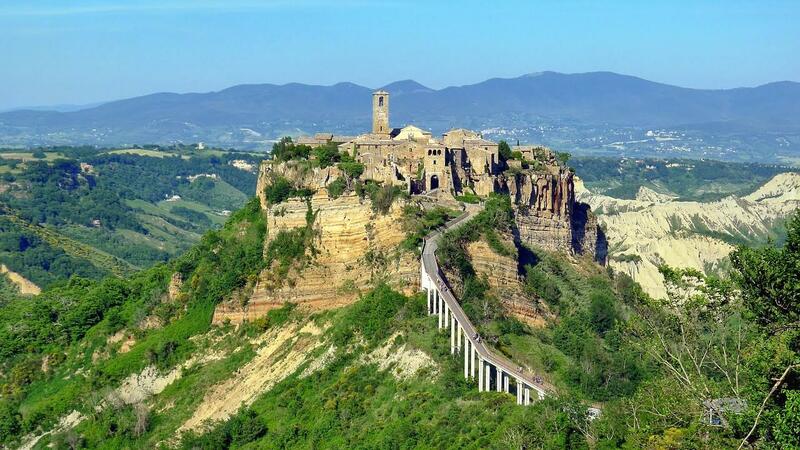 It’s located in the Calanchi Valley, and the only way to reach the town is by walking a long footbridge that connects Civita to Bagnoregio. It’s definitely worth it. 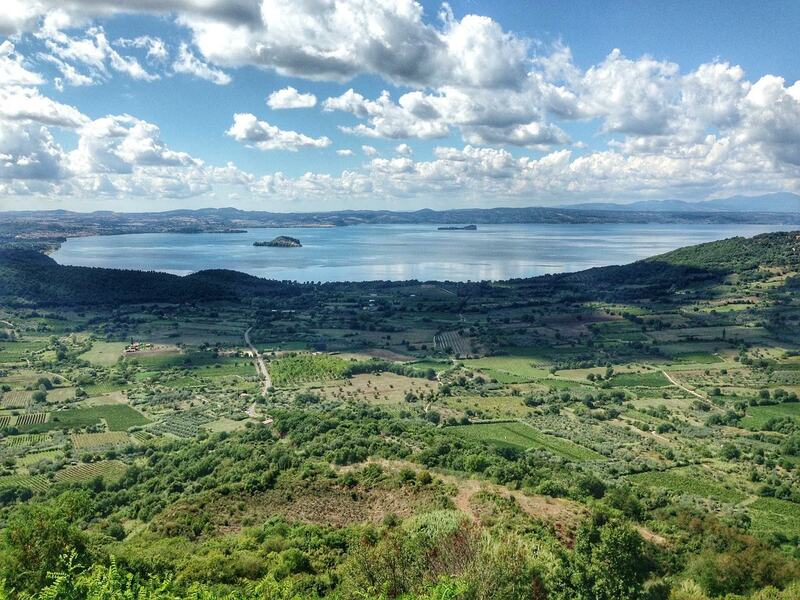 Head to Lake Bolsena to get a taste of the largest volcanic lake in Europe! Sometimes called “Italy’s belly button” for its bowl-like shape in the middle of the Italian peninsula. Along the lake, medieval towns along the shores of the lake await you. From Capodimonte to Bolsena and Montefiascone, there are charming historical sights to visit. And if you’re up for some swimming, this area – also called Tuscia for being in between the Lazio and Tuscany regions – is known for boat rentals, swimming and much more. Travel back to the Middle Ages by exploring this town perched on a tufaceous spur in the Valle del Treja Regional Natural Park. Known as the “borgo of the artists”, Calcata is one of Italy’s most famous fortified small towns. From its winding streets you can admire breathtaking views of the valley and immerse yourself in a fairytale-like atmosphere. 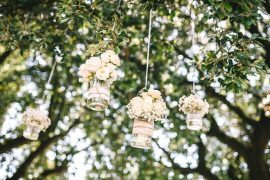 Walk along the town and browse artists’ and artisans’ workshops and studios hidden beneath ivy-clad arches. After exploring the town stop by in one of its characteristic restaurants for a lunch to remember. 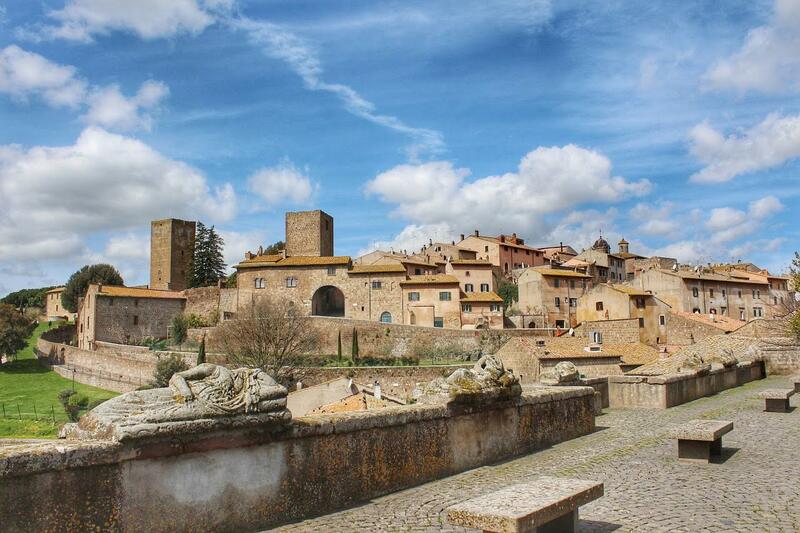 The picturesque town of Tuscania is located in the northern Lazio region and is built on seven promontories of tufa rock. It dates back to Etruscan times and is most famous for its medieval towers and walls and two imposing basilicas in Romanesque style, San Pietro and Santa Maria Maggiore. And just 2km north of Tuscania, you’ll find the famous Necropolis of Tuscania overlooking the valley of the Marta River, where you can visit the Etruscan tombs. After visiting the town, you have to stop by for lunch in one of its characteristic restaurants. Along the Lazio coast, just a one hour and thirty minutes from Rome you’ll find the beautiful seaside town of Sabaudia. This town is the perfect place for a day trip from Rome during the hotter months of the year. 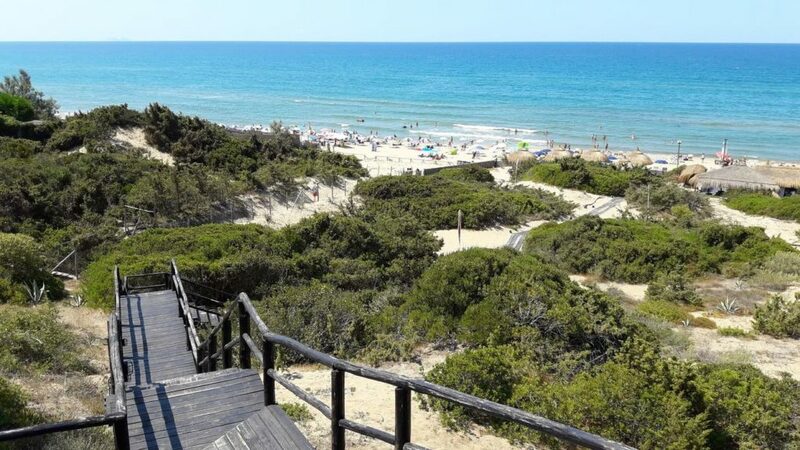 Beautiful beaches, sand dunes, a stunning lake and Mount Circeo await you. Known for being founded in 1933 by Mussolini, Sabaudia was initially a marshland turned seaside town in just 253 days! If you want to breathe some summer air, this is definitely a place to visit. 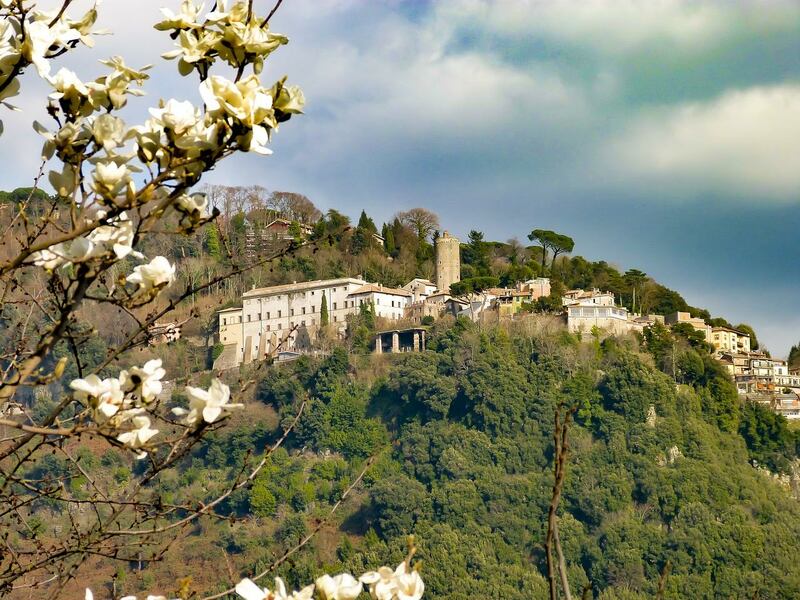 Behold Nemi, one of the most beautiful towns of the Castelli Romani area. This charming town sits on top of a hill overlooking Lake Nemi and is known for its delicious wild strawberries and stunning views of the valley. It is said that Diana of Nemi, or “Diana of the woods” was the goddess of hunting and fertility, thus making the lands surrounding her temple more fertile. Whether it’s a day trip from Rome surrounded by the Alban Hills you’re searching for, or a relaxing day indulging in strawberries, wine and good views, Nemi is surely a magical town not to miss. Sermoneta is one of the jewels of the Lazio region and a must-visit place near Rome. This medieval borgo is perched on top of the Monti Lepini, offering stunning panoramic views of the Pontine valley, surrounded by olive groves. But the town is just as stunning as the views. 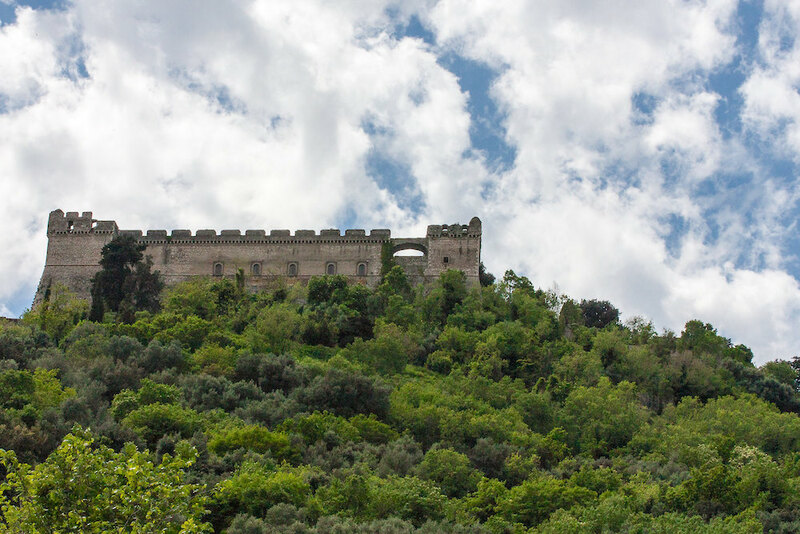 Don’t forget to visit the 13th century Caetani Castle, symbol of Sermoneta, and its prison cells which have just been opened to the public in 2019! And while you’re at it, don’t forget to visit the Garden of Nymphs, known as the most romantic garden in the world, which are just 7km away from the town.